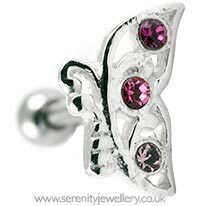 Sterling silver or hypoallergenic surgical steel butterfly design with three crystals on a 316L surgical steel 8mm bar with 3mm screw-on ball closure secured at the back of the ear. The butterfly is 9mm high. 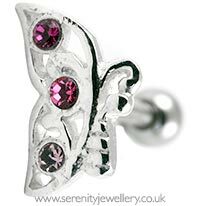 The butterfly stud is designed to follow the curve of the ear so it comes in a left and right ear version. Please select the ear that the earring is for. 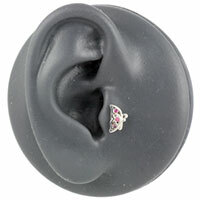 So if you have your left ear pierced you'd need the left ear stud. The one exception to this is front/forward helix piercings where you will need to select the opposite ear for the earring to follow the curve correctly. Really like it! Used for my cartilage piercing and has a nice fit. 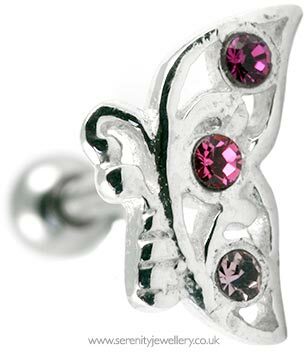 Really pretty, I have a pair for my ear lobes and I really like the way they face each other. I love this earring it is so pretty and the little jem is so sparkly. 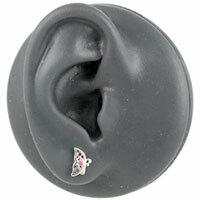 I am wearing it in my earlobe until my cartilage heals and have had loads of compliments about how good it looks. 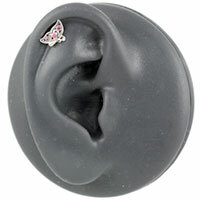 I can't wait to wear it in my cartilage.